California is a stopover on the Pacific Flyway, a major route for the millions of birds that migrate from Alaska to Patagonia. 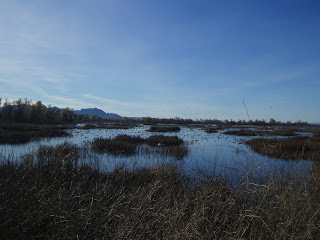 My visit to the Gray Lodge Wildlife Area near Colusa, California last year was an incredible sight to behold, and an experience worth repeating. The Migratory Bird Conservation Partnership seeks to protect, restore, and enhance lands that support bird populations in California. It is estimated that Less than 10% of the state’s original wetland habitat remains today, and the threat of losing more habitat persists. The Partnership is working hard to preserve and enhance the places where these birds rest, feed, and breed in an attempt to reverse the declines that many of these populations have been experiencing. I do my best to support worthy causes by donating time or money, and sometimes both. Regardless of how much or little that I give, the intention is always sincerely appreciated. landing in groups of two, three, or six sometimes and all at oncce. one other takes to flight. the liquid surface of the world. The sound of wings uplifting is like a sudden burst of inexhaustible joy.